The minute this guy decided to return, Team 134's prospects looked increasingly brighter. Michigan's offense was bad in 2012. The idea that you can run a shifty receiver at quarterback and be consistently successful is just not going to happen. Good teams had sniffed out Denard's tricks pretty well by his senior year. And by the time he went down with a nerve injury against Nebraska, the ship had sailed on Shoelace as a passer. Despite that, Michigan's offense still managed to have brief spurts of brilliance, I mean Denard is still Denard. But all too often, those brilliant moments were followed by extended streaks of frustration. So with Denard Robinson, the central figure of Team 131, 132 and 133's offensive attack graduating to the NFL, how does Michigan retool, and take that step forward in 2013? Who's leaving, who's staying and who's coming in? And what's the depth chart going to look like? The quarterback position improved drastically when Devin Gardner stepped into the role against Minnesota in week 9 of the 2012 season. Until then, Michigan's entire offense consisted of various plays designed around Denard hopefully doing Denard things. But that was only going to get you so far. At some point, it's going to be important for the quarterback to actually be able to throw the ball. Against Michigan State and Nebraska, Michigan failed to score a touchdown. Granted those two defenses are no slouch, but since moving Gardner to QB, Michigan has found the endzone 10 times in the last two games. In the first 8 games of the season, Michigan averaged 171.5 yds/gm passing (If you take out the 291 yards passing against UMass, that average drops to 154.4). In the last 2, they've averaged 260 through the air. All the while the running game has stayed relatively on track with it's tepid output from before Gardner's move. There's no question Denard at running back was more of a headache for opposing DC's because that's truly what he was designed for. Devin was and is still a work in progress at QB, but it's clear he has a superior arm to Denard's. I just think all he needed was an opportunity. You could clearly see that his time at WR was a huge benefit for Devin the passer. With Gardner's performance at the end of 2012, the transition to a post-Denard era seems much more tolerable. A steady return to a more pro-style, Michigan-style of offense can and should be expected. But with Devin's athletic ability, don't be surprised to see the spread-option sprinkled in whenever possible. Michigan is good to go with Devin at starter. It's not clear yet whether Gardner will receive his medical redshirt for 2010 or not, which would only make him a junior next year. I think we'll know more about that very soon. My gut tells me he'll get it. Backup Russell Bellomy may still be recovering from his performance against Nebraska, but I think he should only learn from that game. Incoming freshman Shane Morris will likely compete for and eclipse Bellomy for the backup role quickly once fall camp opens up. Michigan had a couple good running back options at the start of the season. Fitz (who was suspended for the Bama opener) was healthy and coming off a strong finish to 2011, Vincent Smith was entering his senior year, Thomas Rawls and Justice Hayes were relatively unknown commodities but expected to be contributors. But the play of the OL, especially the interior truly hindered any sort of success. Michigan was able to move the ball on the ground in 2012, but it wasn't with traditional backs running tradition running plays. Denard accounted for 54% of the overall offense last year, and the bulk of that was on the ground. They're going to have to reinvent a running game to suit Devin at QB. As we saw against Ohio State, a solid running game legitimizes any offense...you can barely win without one. Hopefully Fitz can recover from his broken leg and make a full recovery for his senior year. As of right now, we see no reason why he couldn't. But leg injuries being what they are, especially for a running back, it's really a crap shoot until fall camp. To back him up, Thomas Rawls, who saw no action in the bowl, and Justice Hayes will likely shoulder the load there. Possible incoming recruit Derrick Green, the #1 RB in the country, will immediately elevate the level of this position should he commit. He could actually compete for a starting gig day one. Maybe no other position seems more of a mystery to me than receiver. It's been tough really, for this group. Denard was not the passer these receivers deserved. Guys like Darryl Stonum, Junior Hemingway, Martavious Odoms and Roy Roundtree suffered through the Tate Forcier and Denard Robinson era...and man, that's gotta be tough. Thankfully for batch of receivers both here and on the way, the future looks much brighter. I am constantly impressed with Jeremy Gallon. Despite Roundtree being the better receiver, at least in my mind, he made much better catches. Both he and Dileo are very capable slot-type receivers. Jeremy Jackson and Joe Reynolds have the possibility of being a breakout guys this year. I expect some really big things from Darboh and Chesson, though. I think we all do. Welcome back Michigan tight ends! With the transition back to a pro-style offense, comes the triumphant return of the tight end to the playbook. With two good TE's committed for 2013, that tells me this position is trending again. Underrated, tight ends are in my book. Michigan has a special one in Devin Funchess. The sooner they realize that and make him a pivotal role in this offense the better. I will use the full weight of this blog's influence to tout the virtue of Funchess as one of Michigan's best weapons. The 2012 offense was a step in the wrong direction for Michigan. The various parts and pieces are all somewhat to blame, but none more than the offensive line. 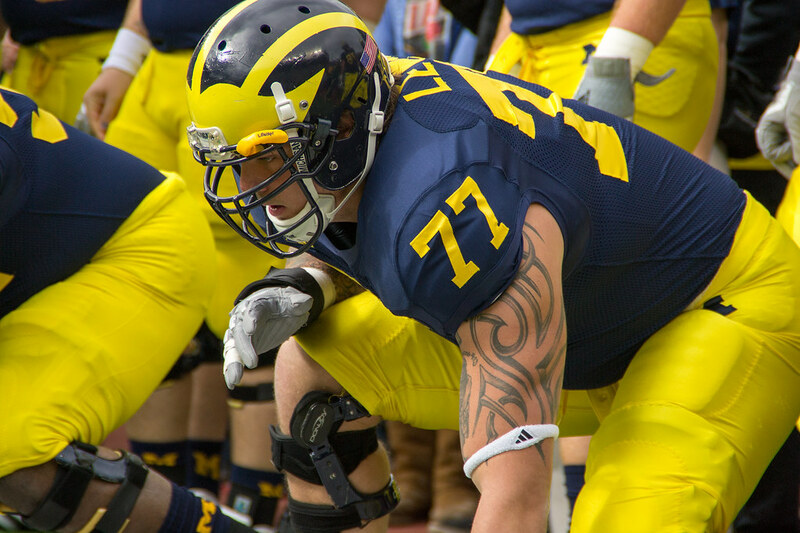 However, with both tackles, Taylor Lewan (!) and Michael Schofield returning, and a glut of young, talented, but albeit inexperienced backups now being forced into starting roles, Michigan's OL seems to be primed to take two steps forward. I won't miss Mealer, Omameh or Barnum. Sorry, they're great guys, but so much of the struggles of 2012 can be attributed to the interior linemen miscues. Expect to see Jack Miller at center, Kyle Kalis at a guard and maybe incoming freshmen Kyle Bosch or redshirt sophomore Chris Bryant or redshirt freshman Ben Braden compete for the other guard spot. By almost all accounts, it won't take long for the 3 new guys to pull ahead of the 3 old guys in terms of overall ability. It's nice bonus that Bosch and Tulley-Tillman are already enrolled. With the guys leaving and the guys coming in, the overall level of this group will likely increase this off-season. I mean hey, we offered a long-snapper fergodsakes. Next up, we'll take a look at the defense. Stay tuned.